SWAN Lyman-alpha whole sky map in ecliptic coordinates. 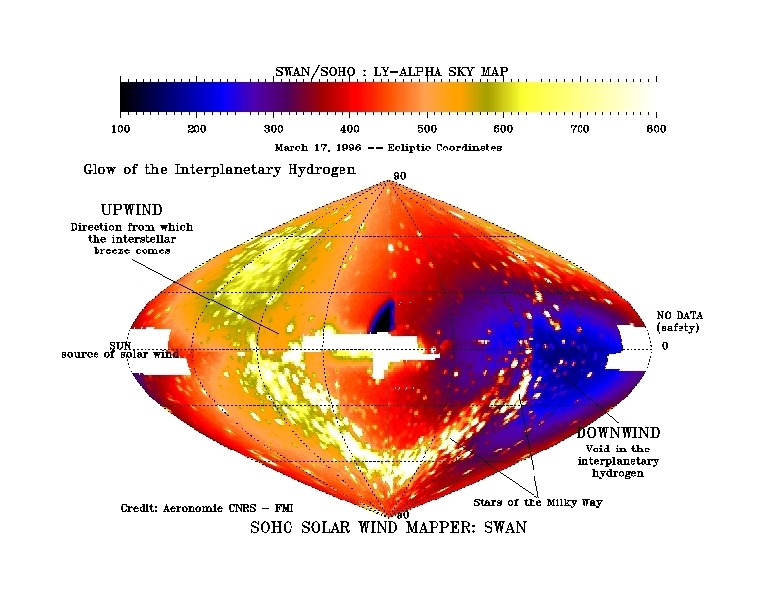 Two areas were not covered for safety reasons, around the Sun and around the anti-solar direction. The color is coding the intensity, in counts per second per pixel (one square degree), which corresponds to 1.3 Rayleigh. A number of UV hot stars can be identified, tracing the galactic plane. The rest of the ubiquitous emission is due to solar UV Lyman alpha photons, backscattered by Hydrogen atoms in the solar system. These H atoms are coming from interstellar space, and are approaching the Sun down to about 2 AU, in the direction of the incoming flow (ecliptic coordinates, longitude 254 deg, latitude 7 deg). A maximum of Lyman-alpha intensity surrounds this upwind direction. In the opposite direction, the emission is weaker by a factor of 3.5, because most atoms have been destroyed by charge-exchange with solar wind protons, creating a cavity void of Hydrogen atoms in the downwind direction. A detailed comparison of such Lyman-alpha maps will allow to determine the solar wind mass flux at all ecliptic latitudes.